Bulk export cargo flows from South Africa showed a moderate but slowing growth of 2.0% in 2014 also following sluggish growth in 2013.Whilst in recent year’s slower growth was more to do with infrastructure constraints (rail and port) there was also a change in the market and notably China’s buying pattern with India other markets appearing as greater influence on volumes. Saldahna port volumes grew slightly in 2014 in spite of flat iron ore volume; this was also boosted by manganese ore volume which moved through the multi-purpose berth due to increasingly tight port capacity for this product. Richards Bay volumes remained largely flat — even though coal volume was up marginally, it was offset by declining other products such as chrome ore. Port Elizabeth is already at maximum due to terminal size. Volume growth is estimated to be 3.6% in 2015. However, this could be conservative as volumes were up over 20% in the first two months of 2015 driven by Saldahna and Richards Bays export volume. Whilst this is only two months, it does suggest a strong year ahead. However, there is uncertainty with infrastructure, industrial climate and the global market, notably China’s slowdown. In terms of opportunities South Africa is largely an export demand location for bulk cargo and notably the major bulks of coal and iron ore which require a large amount of Capesize and Panamax supply. This, of course, moves to RSA in ballast as is the case with other major bulk supply countries. 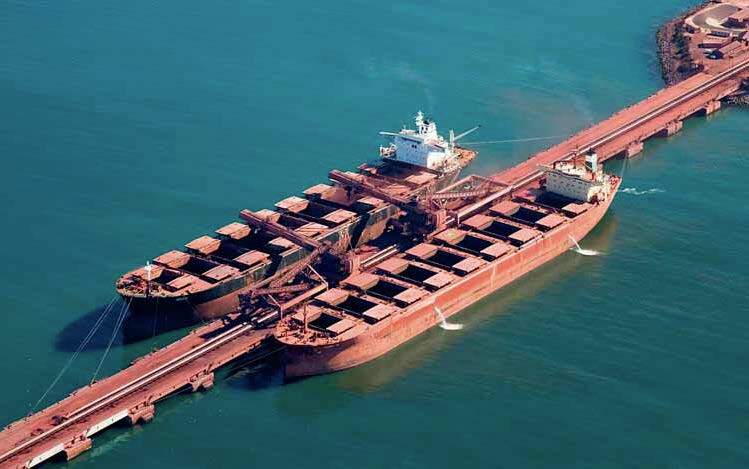 It is in the Handysize and Handymax sector where opportunities for balanced loads in and out could develop and this would be attractive for owners of tonnage in this sector. Traditionally, South Africa has imported wheat, rice, soya flour and fertilizer in sizeable quantities and on a structural yearly basis. This has, in turn, supplied a number of vessels to load minor ores and other products back out. However South Africa has just suffered a major drought in the maize growing areas of the Orange Free State and North West which has impacted the maize crop with a fall of 32% (over 5mt [million tonnes] reduction). This has the potential to swing South Africa from an exporter of maize (2.2mtpa) to importer (1.5mt) during 2015. This will therefore remove some demand for Handy sector export vessels (and therefore the higher ballast bonuses that can go with this) and produce more vessels for export due to increased demand for imports. A 1.5mt import of maize will potentially supply 40–45 additional Handy vessels into the export market and assist the supply/demand balance. This is a welcome win for exporters and bulk vessel owners alike. The flow comparison is assessed in below table highlighting a potential additional 70 x 30,000 tonne (Handysize) equivalent vessels available for export from import demand. On the industrial front, 2014 was another difficult year for the South African mining industry but, again, largely confined to the platinum and gold sectors. However, more radical union incursion into the coal sector looks likely in coming years. Also not helping the mining sector was the well-documented power shortages from the state supplier ESKOM due to high levels of backlog maintenance and new power station delivery behind schedule. Finally, the government-delayed mineral resources bill and with it much uncertainty for mining investment in the future is adding further challenges to industry. On the positive side Transnet, South Africa’s state-owned freight transport and Logistics Company which last year announced a US$ 4.7 billion award for 1,064 locomotives from four overseas manufacturers has now started rolling locomotives off the local production line with 95 units just delivered. They were assembled at Transnet Engineering’s Koedoespoort plant and all but 70 of the ordered 1064 units will be assembled locally. These first 85 units have already been deployed on the Manganese Ore line to Port Elizabeth and the Sishen Iron Ore line. Exports from South Africa grew a little faster during 2014 but in a softer global trade which also grew slowly and, notably, China which declined after rapid growth in the last few years. However, a lot of this was offset by India, which is fast becoming the largest importer of steam coal in the world. This would most definitely have been the reason for global price reduction in coal and Indian demand is driven purely by sluggish growth in Indian mine production, coupled with a more stable Rupee. Against this backdrop, South Africa did well to maintain above- average growth. Richards Bay Coal Terminal (RBCT) led the way with a new record of exports now reaching 71.2mt, up 1mt on 2013. This again was a good performance given a large downtime (power cables electrical fault for ten days in February 2014) which damaged export flows. Transnet Freight Rail meanwhile delivered 72.4mt by rail 2.8% more than 2013 so this therefore looks good for RBCT to achieve a stated goal of 74mt of exports in 2015. Early figures from Richards Bay (RBCT does not publish monthly figures any more) does suggest the year has got off to a good start. Durban volumes declined but rail into Maputo and export definitely moved upwards in 2014 and just maybe RSA exports could reach 80mt in 2015. It is well reported that RBCT can handle 91mtpa so there is plenty of room to grow, and research work has also been done to increase capacity to 110mt in a phase 5 expansion. Ultimately RCBT will need good supply from rail, and that is still a challenge; however the Transnet roll out of increasing locomotives and stock in coming years will assist this process. Transnet is also looking at upgrades to the coal line from the Waterberg (which is where all the new mining growth will come from). Currently this line can only handle 5mtpa but should upgrade to first 30 and 60mtpa by 2018/2019, and this has to be done as the coal resources are significant in this region. seen a major decline from 2009 onwards and a swing to India/China this trend was somewhat reversed in 2014 and Europe volume bounced back whilst Indian volume rocketed to nearly 32mt and looks set to maintain this in the future. China volume dwindled away and it is likely that, with its declining import demand, RSA will no longer be a supplier of choice. It is likely that Europe volume could grow further should coal sourcing from Russia decline. Both Russia and Colombia have been major suppliers to Europe up to now. Interesting times are ahead for the coal trade — a swing back to the Atlantic is likely. In spite of trade volume globally in iron ore increasing rapidly in 2014 (12%), the volume was slower for South Africa in what has been a tough year for this sector. Export figures ex-RSA to various markets compared globally trade are detailed in the table below. As with coal, although not to the same extent, we see China volume declining and other markets growing and this trend may have something to do with other sourcing in Africa. China is still importing iron ore at a rapid rate and has invested heavily in West Africa (Sierra Leone, Mauritania and Liberia) to limit its reliance on other markets. West African exports of iron ore to China reached 35mt in 2014 compared to only 3–4mt in 2011. Whilst West Africa is further away, the increased supply on the world market has contributed to weaker prices and therefore competition between markets with South Africa potentially under threat as a supplier. Again as with coal the stand out change has again been India who imported 4.6mt from RSA in 2014 from virtually a zero base. Significantly India only imported a total of 5.8mt so South Africa is supplier of choice. It is incredible that India only in 2010 was a major iron ore exporter of over 100mt but today it is now nearly a net importer. This could again be a developing market in favour of South Africa. The distribution is starting to change clearly from the destination graph. As reported last year Saldahna exports will remain relatively flat over the next few years as the system waits for Transnet rail and port upgrades. By 2019 the terminal should have 82mt capacity and port infrastructure via stackers, tipplers and an additional shiploader would be installed to handle this. The main question would be with installed capacity will the market be able to take this increased volume if China declines? to the well-documented Eskom power shortages. We have taken a more cautious view on 2015 volume given the weaker global price for ore as well as China potentially reducing demand, so have set growth at 9% to 13.2mt but early export volumes in 2015 do look strong. The challenges continue to come from the logistical dynamics of getting the product to exit port as with most South African bulk cargo. Manganese ore is mined in the Northern Cape nearly 1,000km from its gateway port in Port Elizabeth. In spite of constraints, Port Elizabeth still managed to grow again and moved just over 6mt. Some of the bulk growth continues to be absorbed via Durban through Bulk Connections which handled a new record 3.12mt in 2014 and significantly after only two months in 2015 has shipped a further 850,000 tonnes so is well on course for a new record. There is simply no real further growth through Port Elizabeth and so new channels needed to be found. There was also some export of bulk through Saldahna in 2014 at the breakbulk terminal. Whilst containers have also shared in some of the export growth ultimately bulk is the solution and once Nqgura bulk terminal comes on line with 16mtpa capacity Durban in particular will play an important role. World trade in manganese ore is set to rise to 36mt by 2017 based on forecasts in some areas. The growth is made possible by China not being able to expand its domestic production further, but demand is rising due to stainless steel production. Based on these figures it is essential that South Africa maintains infrastructure growth as it is now firmly the countries third- largest bulk export. Distribution by main destination is shown in the graph and this does appear constant across the markets but again India and Europe are also increasing purchases. Given the challenges on infrastructure, it is therefore important that a solid plan is in place for the future and this is now formally under way through Transnet capacity upgrades. This is via both inland rail upgrades as well as port. The key start-up date for new capacity will be 2018/2019 financial year. It is still hoped that Nqgura Manganese Terminal will be commissioned in 2018/2019 and will have two shiploaders with the ability to load two 80,000dwt Panamax vessels simultaneously, which is a massive ramp up over the current operation in Port Elizabeth handling only one vessel at maximum 60,000dwt capacity. In this respect, it has been interesting to see how Port Elizabeth terminal has coped with increasing volume noting that the terminal has only one berth. In 2010, the terminal handled largely Handysize smaller units but did use 22 Handymax vessels. This grew to 65 Handymax vessels in 2011 and used 94 Handymax vessels in 2014. Significantly we have also seen the use of 23 small size Panamax vessels (65–70,000dwt range) so the port has still handled the same number of vessels per month but increased the load per month. That said, at 6.2mt the system cannot handle further growth so it remains tight supply and demand in this sector for two to three years. The chrome ore exports flows are updated below and shows South African exports declined by 16.5% in 2014 which, in fact, were showing 32% decline by mid 2014. This was entirely the result of the platinum strike lasting five months in the first half of the year. The impact of this was the by-product of UG2 chrome and had a massive effect on export supply. Of more concern in spite of South African short supply, this did not impact the global price which was another factor in less exports overall. Durban which was traditionally the container gateway in the past. What has been positive in 2014 is the re-emergence of ferro chrome exports from South Africa in spite of the power crisis. New energy-efficient furnaces have been installed which has allowed production to grow. In 2014, exports grew to 3.12mt up from 2.7mt in 2013. Volumes were as high as 3.9mt in 2008, so there is some way to go but the numbers are positive. South Africa has also diversified into other markets with this product so China is less than 30% of exports. It has been a turbulent year for South Africa in 2014, and 2015 looks like it could be similar in certain ways but there are positive signs in some sectors and the potential for good growth. The grain trade increased imports will also provide a welcome boost to operators of Handy tonnage to secure two- way trade and this will be an interesting development to watch. ‘Challenges’ and ‘opportunities’ are definitely the watchwords in 2015.